I called a friend to tell them that I was pulling off the highway at Exit 188 and making a stop to get something to eat. I was coming back from visiting my mom who I had just moved to a rehab hospital about 90 miles away from me. My mom spent the past two weeks in the hospital, recovering from surgery to repair her femur that was broken in four places from a fall. She also had a fracture in her neck and a torn rotator cuff. You see, my mom is just 64 but she’s all of 80lbs, so she’s not the kind of 64 year old you may be picturing. As I drove I replayed the difficult conversation we had just had over and over in my mind. I pulled off to grab a bite to eat, requesting a booth in the back where there were no people. I wanted to be alone. I couldn’t tolerate outside noise. Not even laughter. I needed quiet. I needed some peace and figured I’d get some being the only one within a four-booth area. But not so. The conversation that went on played out so loudly, you know the kind, the one that won’t stop, it’s so overbearing you can’t get a word in edgewise, it’s one-sided and oh so annoying, it’s the one that plays out in your head with yourself. What will life be like for her now? What kind of care will she need and for how long? Have I done everything I could do? Have I been a good daughter? Is she able to wrap her head around it all because I’m not sure I can? The conversation that had just taken place between my mom and me was tough. We talked about what she thought the next phase of her care should look like. She’s on Medicaid and not much is covered in the rehab world or in home healthcare. As I began to delicately outline the things that I was concerned about, the things I thought she can no longer safely do on her own, I sensed a great deal of annoyance in her voice. She told me that she was keenly aware of what she could and couldn’t do and that it was really hard to accept. I didn’t mean to be so forthcoming or outright but I wanted her input and for her to know that although our options seem limited, that she does have a voice in this. As she shook her head at me in frustration, I told her, Mom, you know that I’m a communicator. I have to discuss things. I have to get things out in black and white. And as I said that I realized that things are not always black and white. Sometimes they’re gray and she’s told me that in no uncertain terms before. Things can be especially gray when it comes to matters of the heart and hard things in life such as this. And to that she said, I’m a good listener and I only need you to say this once. And so, I wrapped it up. The outcome of her recent fall could have been much worse and I’m so grateful that she is recuperating well. As you can probably imagine, a midnight visit to the powder room is not the same for her as it might be for you and me. But this is a hard time. A hard time to get our heads around all of this. The thought of coming to the realization that you may be on the other side of your life is staggering to me. Recognizing limitations. Accepting that things aren’t going to be what they once were. Where do you go from here? What does life look like now? How do you pay for it all? My mind searched for an answer as I sat in the back booth. It was like I entered the words…now what…in to the Google search bar and the rainbow circle became stuck, spinning out of control. This is not the first time I’ve had this conversation with myself. I had it some 25 years ago on a much more drastic level, in an IHOP at a table with my Granny as we sat there in disbelief. 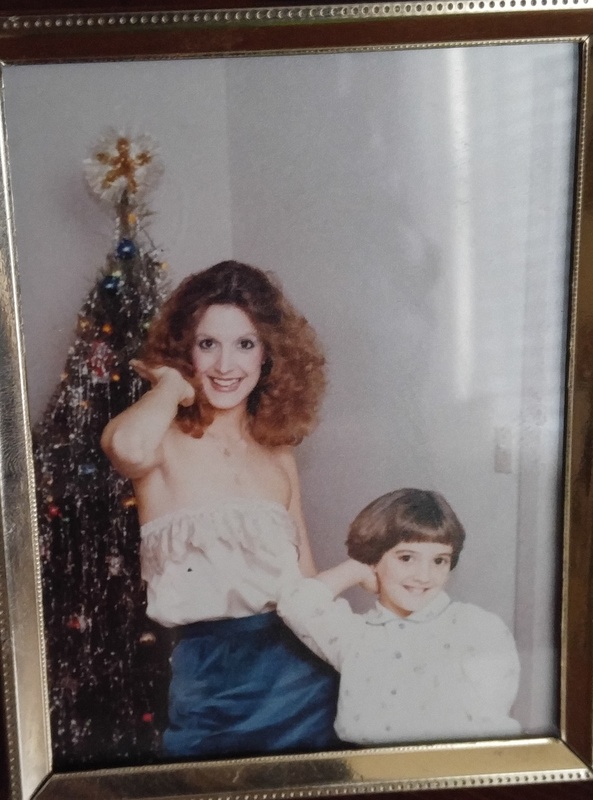 I was just 25 when I got the call that my mom had fallen down a flight of stairs and that she had broken her C1, C2, and C3 vertebrae and she may be paralyzed. After a fight for her life, a case of pneumonia, and facing potential long-term paralysis, she spent months in the hospital followed by weeks and weeks of intense rehab and was left with quite a bit of pain and partially paralyzed with a rare neurological condition called Brown Sequard Syndrome. She’s come a long way. But like anything, if you don’t use it you lose it. I’m not sure what this next phase of life holds for my mom. But I know she has a great attitude. When we’re together we still find plenty of laughs to have and something to poke fun at, even in the midst of hard conversations. Your mother has an incredible gift – you. While I don’t regret having children I would love to have a daughter like you. Tracy – I am so sorry your mom is facing this and you along with her. All I can say are the things I told myself when I was caring for my parents and asked myself a lot of the same questions. I cannot fix this. I can’t make the situation ideal. Even with all the money in the world. This was their journey and as hard as it was to watch – it was their life. At the end all my decisions had to be based on what would keep them safe. And a lot of those weren’t necessarily what made them happy. Those decisions didn’t necessarily make me happy either. Don’t take on too much of the emotional responsibility for this. You are a good daughter. This is just a hard, hard thing. Love to you.